Why Are We Called The Spartans? Straight From The Parent's Mouth!! 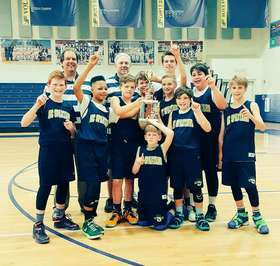 Welcome to the web page of the North Carolina Spartans Boy's Basketball Club Program! This site will provide you with all the information you need regarding the Spartans program and teams. 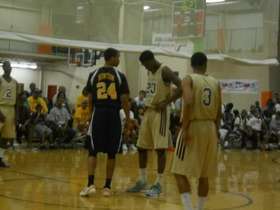 Keep checking the site for up-to-date information regarding NC Spartans Basketball! 2019 will be the tenth season of the North Carolina Spartans Program. We continue to evolve and refine our program to further strengthen the experience and capabilities of all our players.Our overall program philosophy with our younger teams is to have a skill-based focus and concentrate on TEACHING and SKILL WORK and for our ELITE teams we focus on getting our teams and players MAXIMUM EXPOSURE at premier college recruiting tournaments during the NCAA live evaluation periods. As of August 2018, NC Spartans players have earned over 2.5 million dollars in scholarship monies to play college basketball! 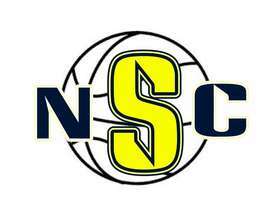 NC Spartans Announces Teams & Age Groups for 2019! 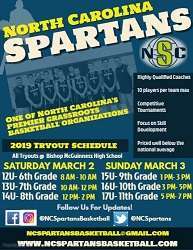 The North Carolina Spartans Club Basketball Program will field teams in SIX age groups in 2019! We hope this season will be our best yet! We plan to field the following age groups for 2019- 12U/6th grade, 13U/7th grade, 14U/8th grade, 15U/9th grade, 16U/10th grade (Local team), 16U/10th grade (Showcase team), and 17U/11th grade (Showcase team) including unsigned seniors!!! Our 12U, 13U, 14U, 15U and 16U Local teams will play in 6 events from March-early June! Our 16U and 17U Showcase teams will play in six events from March-July including the NCAA 'Live' Certified events in which NCAA D1, D2, D3 and college coaches at all levels can be present- as well as other high level events! Please feel free to reach out to us with any questions at NCSpartansBasketball@gmail.com, and follow us on our social media sites by clicking the buttons below! Below you will find the tournament schedules for each of our teams for Spring and Summer 2019! Follow NC Spartans on Social Media!!! 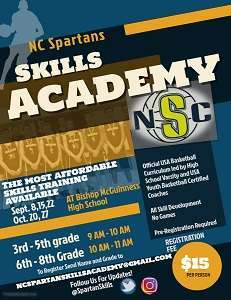 NC Spartans Skills Academy This Fall!!! We are planning to run several skills clinics this fall! We will have a session for 3rd-5th graders (900-1000 AM) as well as a session for 6th-8th graders (1000-1100 AM). Each hour long session will focus solely on skill development- there will be no games played. We want to emphasize skill building and development in these hour long sessions! Sessions will be conducted by high school varsity coaches and players and we will be teaching the USA Basketball Youth Development curriculum. Pre-registration is required. In 2019, NC Spartans will feature TWO grade level travel/Showcase teams- we will field a 16U team as well as a 17U team. Our Showcase teams are different than our local teams as our 17U Travel team(s) are for players whose goal is to play college basketball. Players should only try out for these teams if they have at least one successful year of varsity basketball experience. These team(s) will play NCAA approved "Live" events during the NCAA recruiting period in which college coaches can be in attendance. The major emphasis with these teams is EXPOSURE to college coaches. These teams will play one local tournament as a warmup for the "Live Period" events. These teams are more exposure based and will practice generally once a week. Look for more information to come such as tryout and tournament dates in January 2019!!! Below is a list of players who have come through the NC Spartans program who have went on to play college basketball. NCS 15U Wins Beach Classic Championship in Myrtle Beach SC!!! NC Spartans 17U East Wins the Atlantic Coast Classic in Greensboro NC!!! NC Spartans 15U wins BOND Fast Break Shootout in Winston Salem!!! 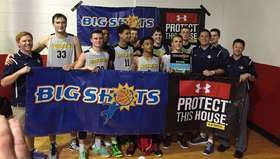 NC Spartans Wins Big Shots Title!!! 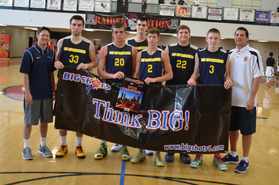 NCS East wins 2017 MB Live 3 Title!!! 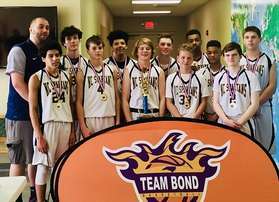 NCS 15U Wins BOND Ballers R Us Part 2!!! NC Spartans 17U Branon Wins BOND April Ballers Classic in 2017!!! NCS East Travel team wins Pound The Rock Classic in 2017!!! 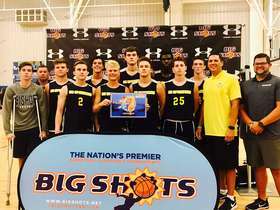 NC Spartans 17U Teams Win Myrtle Beach Big Shots Events!!! NC Spartans 17U East and West Teams each won championships at Myrtle Beach during the NCAA Live Evaluation Period in July 2016! The East team won the Silver Bracket Championship at Big Shots Myrtle Beach Session 3, while the West team took home the Gold Bracket title. 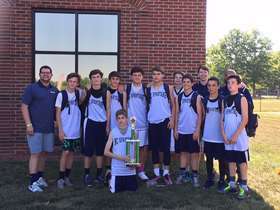 The Spartans program was 6-1 overall for the tournament, and both of our travel teams finished as Champions! NC Spartans 16U wins NTBA Myrtle Beach States!!! NCS 12U Wins StayAlert Safety/PoochPad Invitational Title!!! 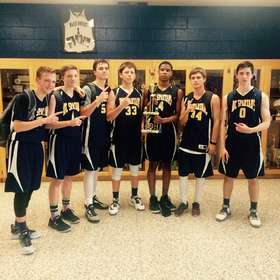 NC Spartans 16U Wins BOND Ballers R Us Tournament!!! NC Spartans 16U Wins 2016 BOND No Bullies Just Ballers Tournament! NC Spartans Elite East Wins 2015 Myrtle Beach The Finale II Title!!! NCS Elite East with the 2nd championship of the 2015 NCAA Live Period! NC Spartans 14U wins Winston Salem "Hoo[p It Up"!!! 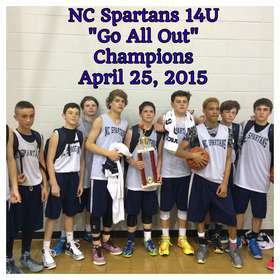 NC Spartans 14U team took home their third championship of the 2015 season! 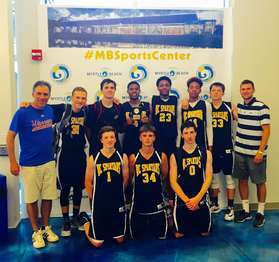 NC Spartans 15U Edmonds Wins Marriott Resorts Summer Slam in Raleigh, NC 5/17/15!!! 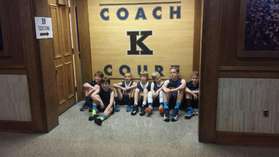 NCS 11U Team Tours Cameron Indoor Stadium!!! NC Spartans Elite West Wins Big Shots DC Certified (April 2015) Championship in Washington, DC!!! NC Spartans 14U Wins "Go All Out" Tournament in Winston Salem! 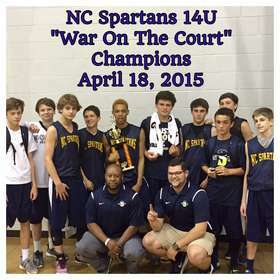 NC Spartans 14U Wins Title at Winston Salem's "War On The Court"!!! 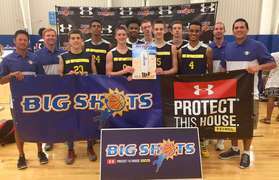 NC Spartans Elite East Wins Big Shots Atlanta Event!!! 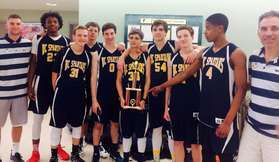 The NC Spartans Elite East 17U team won the Gold Championship in Atlanta, GA at the "Big Shots Atlanta Certified" tournament on the weekend of April 26 2014. 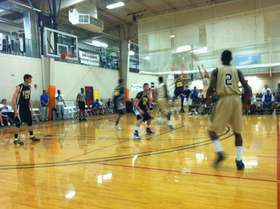 The event was an NCAA "Live" Evaluation period event in which there were numerous college coaches watching the games. 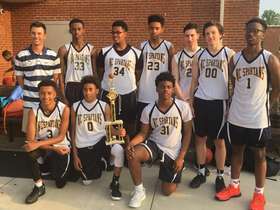 The Elite East team beat North Georgia Heat (GA), Light Em Up (FL), and WCBA (NC) to win the title. 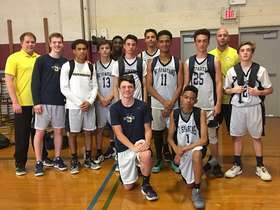 The Spartans had 5 players in double figure scoring in the championship game, and C Will Gardner took home MVP honors, averaging a double-double for the tournament. Congrats to the Spartans! 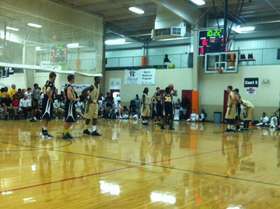 Our Elite Teams played in front of these coaches at one of our events!! Our players get MAXIMUM EXPOSURE to college coaches during our travel season! NC Spartans 16U Regional Team Wins Signature Classic!!! 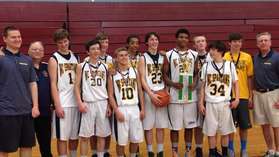 The 16U NC Spartans team won the 'Signature Classic' in Winston Salem NC on the weekend of April 12 2014! 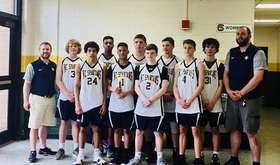 The 16U team is coached by Bob Edmonds, Gene Kemp, and Christian Bessey and features players from Bishop McGuinness, Greensboro Day, Mt Tabor, and Northern Guilford high schools. The tournament was played at North Forsyth High School. Congratulations to the 16U NC Spartans!! 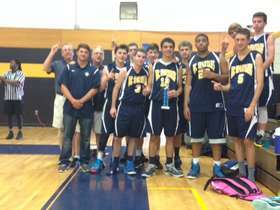 NCS 14U Wins Kings Tourament!!! 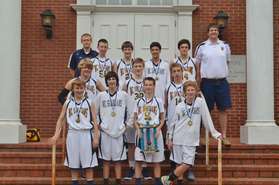 The North Carolina Spartans 14U team finished in first place in the NC Kings tournament on the weekend of April 28, 2012 in Oak Ridge, NC. Coach Searcy and Coach McSwain led the team to a 4-0 record at the tournament, and each player contributed in the wins. Congratulations to the NCS 14U team on the championship!!! NCS Elite 17U Finish in Top 16 at Bob Gibbons Tournament of Champions in Atlanta, GA!!! The North Carolina Spartans 16U and 17U Elite teams travelled to Atlanta, Georgia on the weekend of April 28, 2012 for the Bob Gibbons Tournament of Champions. The April 28 weekend was the last weekend of the NCAA Spring Live Evaluation period in which college coaches are allowed to watch players in events. 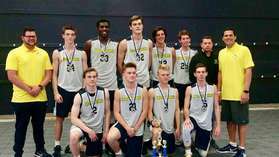 The 17U team finished with a 2-1 overall record, winning their first two games at the event. In the third game, the Spartans fell to the Florida Rams who feature two Top 10 players in the country from the class of 2013. 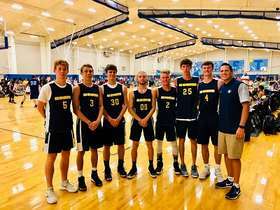 With a Top 16 finish at the event which featured over 80 teams, the 17U Spartans played in front of coaches from schools such as Kansas, Maryland, Florida State, Clemson, Appalachian State, Stetson, and North Carolina State. Congratulations to the NC Spartans on their finish at the Bob Gibbons and best of luck in the July period as they travel to Myrtle Beach, Kentucky, and Virginia for more events! 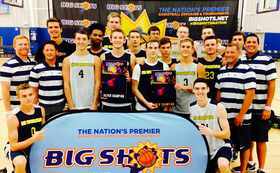 Greyson Collins Named Standout at Big Shots Myrtle Beach Event!!! 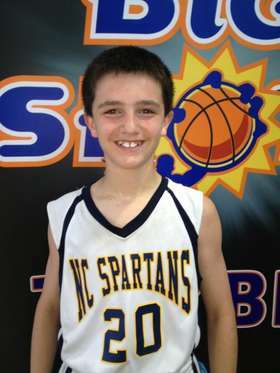 NC Spartans 12U Player Greyson Collins was named to the 'Standout Players' list at the Big Shots Myrtle Beach event for the weekend of May 4-6. Led by Greyson, the NCS 12U team finished with a 2-1 record and finished runners-up in a split 12U/13U division at the Big Shots Myrtle Beach event. Congratulations to Greyson and the team on this accomplishment! 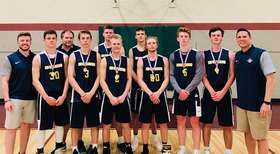 NCS 15U Wins BOND Fast Break Shootout!! !